As drivers, we aren't always aware of pedestrians, because our vision is blocked, we are distracted, or we just didn't anticipate or look for pedestrians in our path. As pedestrians, sometimes we forget to look both ways when crossing the street, we ignore traffic signals at intersections, we neglect to use safe and marked routes like crosswalks, and sometimes our lives are so hectic that we do not pay attention to the traffic moving around us. On average, 5,000 pedestrians are killed each year. 85,000 pedestrians are injured every year. A pedestrian is killed or injured about every 7 minutes. In a typical 8-hour workday, 4-5 pedestrians are killed. Every day 13-14 pedestrians are killed. A "jet-load" (190) of pedestrians are killed every two weeks. Every day, about 232 pedestrians are injured. 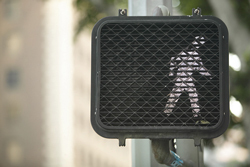 Pedestrian injuries and fatalities result in at least $20 billion in societal costs. 60 percent are working adults. 23 percent are elderly persons aged 65 or older. 17 percent are children up to the age of 20. Approximately 50 percent of pedestrian fatalities occur between the hours of 6:00 p.m. and midnight (a six hour window). * Statistics provided by the National Highway Traffic Safety Administration's Fatality Analysis Reporting System. NOTE: New Jersey State law requires drivers to stop for pedestrians in crosswalks. When you are turning, you often will have to wait for a "gap" in traffic. Beware that while you are watching for that "gap," pedestrians may have moved into your intended path. Be predictable. Stay off highways and restricted zones. Use sidewalks where provided. Cross or enter streets where it is legal to do so. Make it easy for drivers to see you - dress in light colors and wear retro-reflective material. It might be wise to carry a flashlight in very dark areas. Be wary. Most drivers are nice people, but don't count on them paying attention. Watch out - make eye contact to be sure they see you!